Infinite Art Tournament: Annals of Random Reading: The Eight Shelves, Part One. Annals of Random Reading: The Eight Shelves, Part One. When I first moved to the City of Roses, I was for some reason a little at a loss for what to read. I remember being downtown at the Central Library thinking that it would be interesting to pick a column of shelves, to choose one book apiece off of each of the shelves, and to see what happened. I never actually did that, but one day last December I found myself in front of the “books on CD” shelves in an empirical mood, and started picking one book apiece from each of the eight shelves. I took them home and ripped them to the little electronic gadget I use to read while I run (I call it the “stories,” often in the sentence “I can’t find my stories!”). After six months, I have now given my best shot at all eight of the books (in and among plenty of others, of course), and am ready to report my findings. The initial stage of the experiment – that’s too say, the part where you pick out your books – is a bit eye-opening. Obviously, there are bookshelves in the world where it would be painful to have to limit yourself to a single choice amongst all of the awesomeness (my brother’s personal bookshelves jump to mind). But when you are choosing from among an essentially random selection of books washed up on the shelves of a branch library, you really start to realize that there is a lot out there that you would never, ever want to read. There are plenty of books, for instance, in genres that just don't appeal to you, or on topics that you are simply not interested in. There are furthermore many books that survive on past their mayfly lifespan (Running Microsoft Access for Windows 95, say), and are really just waiting to be claimed by the dustbin of history. There is also of course a surprising volume of twaddle – diet books, political screes, conspiracy hooey, instant histories of insignificant events, and worse. You know this stuff is out there, but when it appears on a menu that you are actively choosing from, its volume can be a little alarming. Secondly, when you are choosing a book without prior knowledge of its contents, you must take advantage of information and cues provided on its surface by the publisher. Fortunately, this is not hard to do: it is necessary and fairly easy to judge a book by its cover. But everyone knows this. Here’s what happened with my eight selections. I’ll include the rating (out of five stars) and review (in italics) that I gave it on my Goodreads account. Right ho. Extremely light reading, but one a year during the winter months is not entirely without merit, sir. Of the eight books chosen, this was the only one where I had a good sense of what I was getting into. I had listened to Wodehouse’s Jeeves stories before, and while they can be a bit precious in bulk, they are a perfectly good lighthearted entertainment in limited doses. I count this one as a win. Good writing about a brilliant detective and the oddball shut-in blowhard he attaches himself to. Not to be read for feasibility of plot or special insights into human character, but an entertainment that has aged well. 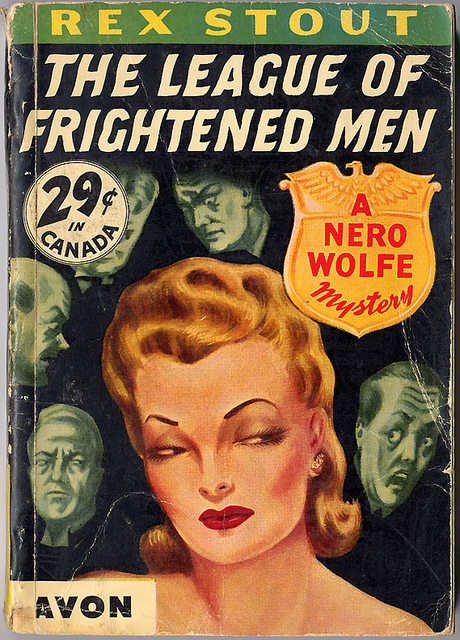 League of Frightened Men is the second book of the Nero Wolfe series. I’ve seen Nero Wolfe paperbacks lying about all my life without ever being especially tempted to pick one up, but apparently it was the best thing I could find on the shelf. This was a big win. After listening to this one, I got an audio version of the first book in the series and have since eye-read books number three, four, five, and thirty-one (books number five and thirty-one having been packaged weirdly together in a two-books-in-one-volume sort of deal). I am hooked. Archie Goodwin, the point-of-view character, is a terrific character, and the background teems with the flavor of New York in the 1930s and the ideas, values, and ways of life in the United States of eighty years ago. And there are FORTY-SEVEN books in this series. It’s like Christmas. This was a reasonable piece of fiction about art and art dealing in Paris before and during the Nazi occupation. I don’t remember it very well, which is not necessarily the best of signs. You didn’t think I was going to hit strikes with all eight books, did you?